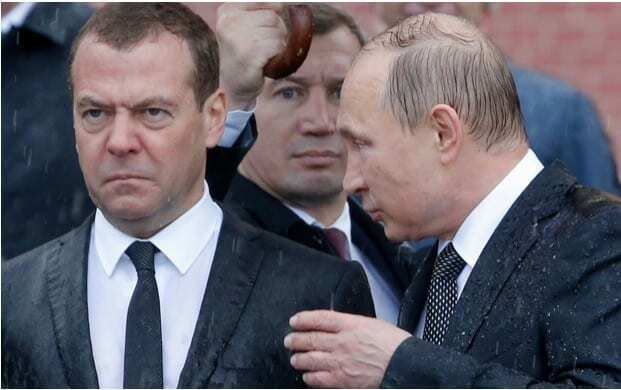 Putin and Medvedev at a ceremony, in the rain. Corrupt or criminal as the Western media never cease to insist (with appalling double standard), there’s no doubt Russian politicians are far more real, seldom lose the ordinary citizen’s touch. Can anyone imagine a soaked US president or a French leader exposing his head to the elements? As far as the world is concerned, the news from Russia is mixed. 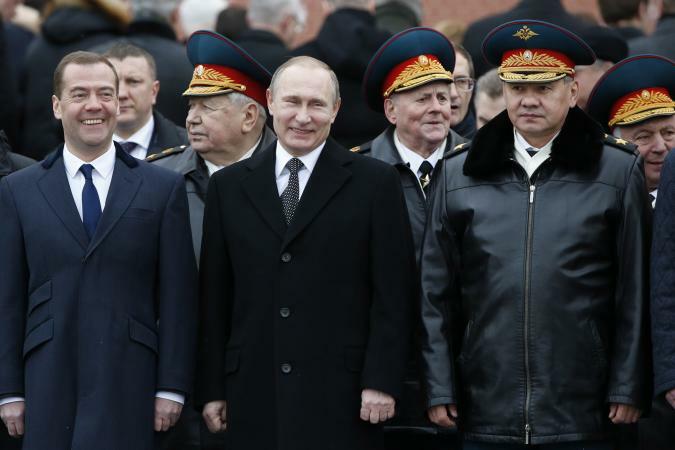 Putin was elected, with substantial majorities, which suggests continuity of policy and vision. And with all the possible flaws you can find in the mass elections of a great and complex nation, Russia offered the world a much more vigorous and diversified political contest than what we usually see under the corporate uniparty sham that passes for democracy in the US. That’s the good news part. Now here’s for the less encouraging part. While Putin has proved to be a capable and even admirable statesman, even if perhaps over-cautious in dealing with the empire at times, his watch has been marked by the resurgence of Russia as a pivotal force in world affairs, one desperately needed to check the insane abuses and threats of the Neocon-infested US hegemon. So far so good, so what is the bad news? The bad news is that Putin—inexplicably—has chosen to keep as PM a confirmed “Atlanticist,” Dmitry Medvedev, a man rightly disliked and distrusted by most patriotic Russians who correctly see in him a prominent fifth columnist willing and eager to lead Russia into the arms of the West, and deepen the Wall Street neoliberal style of disastrous economic policy liable to choke Russia in the foreseeable future. For a discussion of what this very real threat entails, see Medvedev re-nomination: this does not look good (https://www.greanvillepost.com/2018/05/08/medvedev-re-nomination-this-does-not-look-good/ ). And be sure to read our addendum, Paul Craig Roberts and Michael Hudson: Privatization Is the Atlanticist Strategy to Attack Russia. It clarifies why an unrepentant Atlanticist in the pack is something to really worry about. A case of obdurate, naive faith in the magic of capitalism? The Putin re-election, by strong majorities, was expected in Washington, so the spinmasters had prepared their standard “fix”: basically to deride, poo poo and question the legitimacy of the whole process, thereby allowing the presstitutes to continue to call Putin’s rule “authoritarian” (read: dictatorial, therefore not “democratic” by our hallowed standards, and consequently illegitimate, making it a free fire zone for constant denigration.) “Tyrant” has gained a great deal of traction lately, spearheaded by the abject Brits. Leaving aside the sheer stunning cynicism of this posture since we rarely bandy such words in connection with out and out murderous autocrats the Washington plutocracy approves of, like the Saudi mafia, none of this is new, nor liable to make the demonisation of Putin (and Russia) much worse. Russiagate, all by itself, not to mention Washington’s false flag campaigns ever since Putin was perceived to be an independent minded ruler (i.e., “shooting down” of the MH17; the Crimea “takeover”; “invasion of the Ukraine”, l’affaire Skripal, and the Douma non-existent gas attack, among others) have long prevented any civilised dialog between Russia and the US, two nuclear superpowers upon which the fate of the world depends, let alone a mild rapprochement as the clueless but unprincipled Trump once suggested, to eternal and obsessional damnation by the deep state. It does not surprise us, then, to see CBS filing a shallow and cynically misleading report on the Putin inauguration, literally dripping the kind of deep state anti-Russia propaganda that distinguishes US media output. The piece is delivered by Moscow’s CBS Grande Putain Elizabeth Palmers, a woman who obviously does not begin to understand the meaning of shame, nor does she seem to care about her contribution to stoking the fires of great nuclear-armed super power confrontation. Opportunism and sociopathy are of course a personality requirement for successful careers in western corporate media. Look closely below, as Palmer never mentions that Navalny is well known for his CIA/ Western NGOs connection, and is correctly regarded as a tool of the West by many Russians. The protests are basically “color revolution” staged events, for the benefit of eagerly awaiting Western media. Simple photo ops to fool the clueless sheeple back home. The fact these people are still allowed to operate and seed the Western mind with rank disinformation testifies to the liberties that still exist in Russia (or the naivete or incompetence of Russian authorities), comparable or more robust than those protecting similar events in the West. More than a thousand protesters have reportedly been arrested in Russia just days before Vladimir Putin’s inauguration. Those arrested include Putin’s longtime rival Alexei Navalny. Elizabeth Palmer reports. 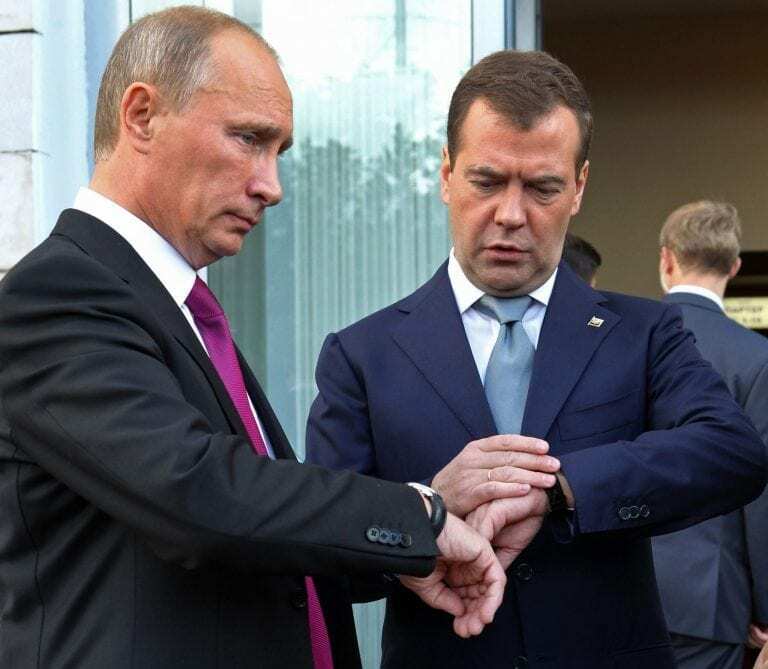 Medvedev, right, and Putin synchronize their watches during a United Russia party congress in Moscow, Saturday, Sept. 24, 2011. The question now is whether their close collaboration signals a good or a bad phase for Russia and the world. NOTE: Readers are asking to know who, in addition to the Western-financed NGOs, are the Fifth Columnists inside Russia. Michael Hudson and I left the description general as Atlanticist Integrationists and neoliberal economists. The Saker provides some specific names. Among the Fifth Columnists are the Russian Prime Minister, head of the Central Bank, and the two top economics ministers. They are springing a privatization trap on Putin that could undo all of his accomplishments and deliver Russia to Western control. Two years ago, Russian officials discussed plans to privatize a group of national enterprises headed by the oil producer Rosneft, the VTB Bank, Aeroflot, and Russian Railways. The stated objective was to streamline management of these companies, and also to induce oligarchs to begin bringing their two decades of capital flight back to invest in the Russia economy. Foreign participation was sought in cases where Western technology transfer and management techniques would be likely to help the economy. Meanwhile, the combination of a rising domestic budget deficit and balance-of-payments deficit has given Russian advocates of privatization an argument to press ahead with the sell-offs. The flaw in their logic is their neoliberal assumption that Russia cannot simply monetize its deficit, but needs to survive by selling off more major assets. We warn against Russia being so gullible as to accept this dangerous neoliberal argument. Privatization will not help re-industrialize Russia’s economy, but will aggravate its turn into a rentier economy from which profits are extracted for the benefit of foreign owners. To be sure, President Putin set a number of conditions on February 1 to prevent new privatizations from being like the Yeltsin era’s disastrous selloffs. This time the assets would not be sold at knockdown prices, but would have to reflect prospective real value. The firms being sold off would remain under Russian jurisdiction, not operated by offshore owners. Foreigners were invited to participate, but the companies would remain subject to Russian laws and regulations, including restrictions to keep their capital within Russia. Also, the firms to be privatized cannot be bought with domestic state bank credit. The aim is to draw “hard cash” into the buyouts – ideally from the foreign currency holdings by oligarchs in London and elsewhere. Putin wisely ruled out selling Russia’s largest bank, Sperbank, which holds much of the nation’s retail savings accounts. Banking evidently is to remain largely a public utility, which it should because the ability to create credit as money is a natural monopoly and inherently public in character. Despite these protections that President Putin added, there are serious reasons not to go ahead with the newly-announced privatizations. These reasons go beyond the fact that they would be sold under conditions of economic recession as a result of the Western economic sanctions and falling oil prices. The excuse being cited by Russian officials for selling these companies at the present time is to finance the domestic budget deficit. This excuse shows that Russia has still not recovered from the disastrous Western Atlanticist myth that Russia must depend on foreign banks and bondholders to create money, as if the Russian central bank cannot do this itself by monetizing the budget deficit. Monetization of budget deficits is precisely what the United States government has done, and what Western central banks have been doing in the post World War II era. Debt monetization is common practice in the West. Governments can help revive the economy by printing money instead of indebting the country to private creditors which drains the public sector of funds via interest payments to private creditors. There is no valid reason to raise money from private banks to provide the government with money when a central bank can create the same money without having to pay interest on loans. However, Russian economists have been inculcated with the Western belief that only commercial banks should create money and that governments should sell interest-bearing bonds in order to raise funds. The incorrect belief that only private banks should create money by making loans is leading the Russian government down the same path that has led the eurozone into a dead end economy. By privatizing credit creation, Europe has shifted economic planning from democratically elected governments to the banking sector. There is no need for Russia to accept this pro-rentier economic philosophy that bleeds a country of public revenues. Neoliberals are promoting it not to help Russia, but to bring Russia to its knees. Essentially, those Russians allied with the West—“Atlanticist Integrationists”— who want Russia to sacrifice its sovereignty to integration with the Western empire are using neoliberal economics to entrap Putin and breach Russia’s control over its own economy that Putin reestablished after the Yeltsin years when Russia was looted by foreign interests. There is talk of a deal being made with the oligarchs. The oligarchs will buy ownership in the Russian state companies with money they have stashed abroad from previous privatizations, and get another “deal of the century” when Russia’s economy recovers by enough to enable more excessive gains to be made. The problem is that the more economic power moves from government to private control, the less countervailing power the government has against private interests. From this standpoint, no privatizations should be permitted at this time. Much less should foreigners be permitted to acquire ownership of Russian national assets. In order to collect a one-time payment of foreign currency, the Russian government will be turning over to foreigners future income streams that can, and will be, extracted from Russia and sent abroad. This “repatriation” of dividends would occur even if management and control remains geographically in Russia. Selling public assets in exchange for a one-time payment is what the city of Chicago government did when it sold the 75 year revenue stream of its parking meters for a one-time payment. The Chicago government got money for one year by giving up 75 years of revenues. By sacrificing public revenues, the Chicago government saved real estate and private wealth from being taxed and also allowed Wall Street investment banks to make a fortune. It also created a public outcry against the giveaway. The new buyers sharply raised street parking fees, and sued Chicago’s government for damages when the city closed the street for public parades or holidays, thereby “interfering” with the rentiers’ parking-meter business. Instead of helping Chicago, it helped push the city toward bankruptcy. No wonder Atlanticists would like to see Russia suffer the same fate. Using privatization to cover a short-term budget problem creates a larger long-term problem. The profits of Russian companies would flow out of the country, reducing the ruble’s exchange rate. If the profits are paid in rubles, the rubles can be dumped in the foreign exchange market and exchanged for dollars. This will depress the ruble’s exchange rate and raise the dollar’s exchange value. In effect, allowing foreigners to acquire Russia’s national assets helps foreigners to speculate against the Russian ruble. Of course, the new Russian owners of the privatized assets also could send their profits abroad. But at least the Russian government realizes that owners subject to Russian jurisdiction are more easily regulated than are owners who are able to control companies from abroad and keep their working capital in London or other foreign banking centers (all subject to U.S. diplomatic leverage and New Cold War sanctions). At the root of the privatization discussion should be the question of what is money and why should it be created by private banks instead of central banks. The Russian government should finance its budget deficit by having the central bank create the necessary money, just as the US and UK do. It is not necessary for the Russian government to give away future revenue streams in perpetuity merely in order to cover one year’s deficit. That is a path to impoverishment and to loss of economic and political independence. Globalization was invented as a tool of American Empire. Russia should be shielding itself from globalization, not opening itself to it. Privatization is the vehicle to undercut economic sovereignty and increase profits by raising prices. Just as Western-financed NGOs operating in Russia are a fifth column operating against Russian national interests, so are Russia’s neoliberal economists, whether or not they realize it. Russia will not be safe from Western manipulation until its economy is closed to Western attempts to reshape Russia’s economy in the interest of Washington and not in the interest of Russia. When two preeminent economists like Michal Hudson and Paul Craig Roberts take the time to jointly issue a stark warning to the Kremlin President Putin really ought to pay attention. The combined wealth of knowledge and experience of Hudson and Roberts is simply unparalleled and their record clearly shows that they both are friends of the Russian people. I honestly believe that to ignore their warning would be absolutely irresponsible. “Those Russians allied with the West—“Atlanticist Integrationists”— who want Russia to sacrifice its sovereignty to integration with the Western empire are using neoliberal economics to entrap Putin and breach Russia’s control over its own economy that Putin reestablished after the Yeltsin years when Russia was looted by foreign interests“. Putin cannot wait much longer. He needs to take action now. All his supporters have been literally begging Putin to finally purge the government from what in Russia is called the “economic block of the government”. There are plenty of excellent Russian economists capable of *truly* begin to reform the Russian economy (Glaziev) and most of the Russian business community will enthusiastically support such reform. But the first step in this process must be to finally take action against the Atlantic Integrationists. Now. The Saker is the nom de guerre of a Russian-descent former military geopolitical analyst. He is the founding editor of The Saker network of sites focused on the Russo-American struggle. Former economist and media critic Patrice Greanville is the founding editor of The Greanville Post. Maybe Putin and Medvedev are just playing good cop bad cop! Were we not told V.P. had/has a “deal” with “the oligarchs” (in order to keep the country together) ? If he rotates with D.M., then who represents the oligarchs in the deal ? Why should we be surprised D.M. is (and must stay) there ? Why nothing about the quality of schooling for the masses, if it’s widely acknowledged they are clueless ? Why has P.C.R. declined to write an article on the subject (years ago, for O.E.N. ), claiming he knows nothing about it (while he taught in various universities in his career, among other things) ? What are the chances of one prevailing, when one allies oneself with the cattle against the owners of the slaughterhouses ? Who among the working class can read an article such as this one (or such as those published here) and how many actually do, regardless ? I was referring to the English pronunciation of the current French president (with a precise point about it). My “monologue” (I was talking to you, Sir, in the first place!) was … utterly lacking! There are decent explanations for why “an language teacher” would write like that, but … it doesn’t look good. Another eyebrow-raising couple of lines: “fact” can’t be “sir”: “sir” is a vocative in need of being separated by two commas. Between Mr. Vltcheck and me, he is the westerner (geographically), by a long shot. And he doesn’t utter a word about the abysmal standards of education for the masses in Democracy – I do. This gentleman, though, thinks highly of Mr. A.V., sees nothing in my words. While is true that the masses (statistically) do not cry for being schooled (properly, at elite standards! – and neither do you, Sir! ), how do you think they will prevail today ? It was VERY hard 100 years ago (and they wasted that chance), it’s not easier today – on the contrary, it’s much, much harder. And nobody here touches it. It’s not looking good. On pondering, I would really like to delve into your “statistics” as I am always open to factual information that can correlate and be of mutual benefit among we masses. Education and knowledge do not always correlate however, as is painfully evident in A.V`s articles concerning colonial education and culture. In short, my education began when I left an “elite” institution. As for schooling for the masses? Foreign language communication is not a strength among your elitists.